August’s Harvest one of the largest commercial?garlic growers of Ontario, sits on 100 acres of farmland just north of Stratford, Ontario and has been growing garlic commercially for 30 years; supplying grocery stores, food services, CSA food boxes and clean seeds for gardeners and farmers, as well as garlic feed supplements for race horses and livestock farmers across North America. Warren Ham grew up on a farm in Eastern Saskatchewan on the Canadian Prairies. He attended Simon Fraser University in Theatre, which his excuse being a bad actor, and one bulb short of a full bushel for the balance of his working life. Warren grew an acre of garlic 27 years ago. Over the years Warren has been a part of growing fields of garlic from 1 to 100 acres. The farm has supplied some of the major grocery chains across Canada and the US, but mainly providing garlic seed to individual growers, farmers, and seed houses across North America. As a member of the Garlic Growers Association of Ontario for 27 years he has served in most capacities. He has worked with the University of Guelph and governments to develop disease and virus free garlic seed for the strains of garlic grown in Ontario. Both immigrant grandfathers given names were August as well as being Warren’s middle name. So the farm name is not about being austere, or about a time of year, but refers to new starts in life. Warren is one of the original founders of the Stratford Garlic Festival. 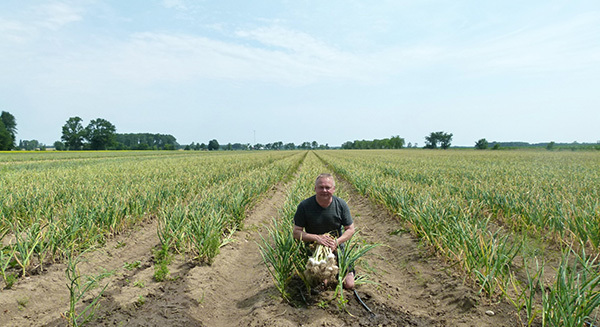 The need to shed light on the garlic industry was critical as the number of acres of garlic being grown in Ontario had dropped by 95% in just 3 short years. Raising awareness on Ontario garlic was an important part of starting the festival.